Visit Exeter - The Cathedral, University and around Exeter. Many people visiting Exeter stay for a week or two and combine enjoyment of the city itself, with visits to locations all around the South West. There’s something for everyone here in the beautiful English city of Exeter – with many ways to travel and places to visit, all of this accompanied by a relaxed stay. 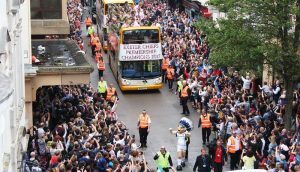 The city attracts visitors from all over the world and many South West locations are reachable within an hour’s travel from Exeter. The temperate climate allows for great gardens to thrive including The Lost Gardens of Heligan, Stourhead and the RHS Garden Rosemoor. For something local try the National Garden Scheme! 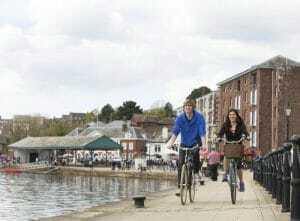 When you explore Exeter there’s no need to use your car, as everywhere in the city is within an easy walk. If you’d like to venture a little further afield there are many local trains, buses and options for short term rental of electric bikes and cars, bikes and canoes! There are great scenic railways – locally the lines along the Exe and the South Devon Coast or the Tarka line to Barnstaple offer many fantastic views and opportunities to stop for a walk or some exploring. 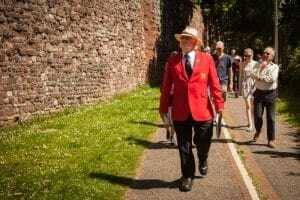 If you would prefer to let somebody else organise your tours from Exeter take a look at Unique Devon Tours. Exercise the body, the mind, or just chill out! There are plenty of opportunities to exercise the body and mind abound in Exeter and beyond. Whilst you walk or cycle the Exe Estuary Trail, take a breather and spot some of the many visiting birds – a great way to distract your mind from the hustle and bustle of everyday life! The weather doesn’t stop the people of Exeter from staying active – why not visit the Quay Climbing Centre or put your walking boots on and take part in letterboxing on Dartmoor! Here are some suggestions on how to Get Active in South Devon. The South West Coast Path is Britain’s longest national trail, a staggering 630 miles starting in Minehead and finishing in South Haven Point. It’s an outstanding experience and there are lots of short sections that you can enjoy for a day or even half-day walk. In Exeter you can walk the City Walls or the longer Green Circle to find out what the city is all about! Whether your interest is in fresh water or the sea there is a wide range of water sports – highlights include canoeing, kayaking, surfing or just sitting back and enjoying a day cruise. As well as the world’s biggest music festival held at the end of June most years at Glastonbury, there are plenty of other music festivals in the South West. Local to Exeter are Beautiful Days, Chagstock, as well as Port Eliot, just beyond Plymouth, being a wonderful experience. 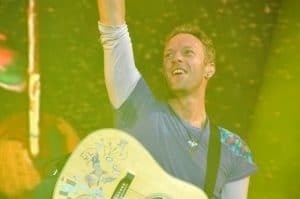 Musicians from Muse come from Devon, as well as other artists including Ben Howard, Seth Lakeman and Chris Martin from Coldplay! Uncover the History and Heritage of South Devon through the National Trust. Visitors are increasingly coming to the area to trace their ancestors and a good place to start is the Devon Heritage Centre in Exeter or the Cornwall Family History Society. Art in South Devon ranges from ancient to modern, from Sir Joshua Reynolds, founder of the Royal Academy to Damian Hirst, one of the leaders of Young British Artists. For lovers of modern art, a visit to see Hirst’s powerful Verity in Ilfracombe makes for a great day out as does a visit to Bruton and the Hauser & Wirth gallery. Closer to Exeter, a visit to the Devon Guild of Craftsmen in Bovey Tracey can easily be combined with Dartmoor. The region has long attracted authors and poets – Agatha Christie, Daphne du Maurier, Laurie Lee, Thomas Hardy, Ted Hughes, Sylvia Plath and Michael Morpurgo amongst many others. 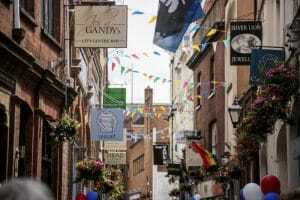 Stroll down Gandy Street in Exeter – the rumoured inspiration for Diagon Alley in JK Rowling’s Harry Potter books. For those interested in literature, there are festivals across the region including Budleigh Salterton and Ways with Words at Dartington. Thinking further afield, the South West isn’t short of a theatre or two. The outdoor Minack Theatre in Cornwall is one of a kind, high on the cliffs in Porthcurno, Cornwall… whilst Exeter is home to Exeter Phoenix, Barnfield Theatre and Exeter Northcott Theatre! If film and television locations interest you, take a visit to Port Isaac to see the location for the popular TV series Doc Martin. There are also opportunities to visit TV locations for Poldark, the Rosamunde Pilcher books so popular in Germany and films such as The Mercy and Warhorse. Our region is renowned for its food and drink – you can trace the produce from source to table! Take a look at the Exeter Food & Drink trail, Food and Drink in South Devon, Exeter Festival of South West Food and Drink and the Seafood Coast! For spectator sport there’s a world class Rugby union with the Exeter Chiefs, the community owned Exeter City Football Club with a great tradition of developing young players and horse racing at Exeter Racecourse. As well as this, county and international cricket can be enjoyed at Taunton. Make sure you check out what events are taking place in Exeter and Devon during your stay. In 2020, there will be events in Dartmouth and Plymouth to celebrate 400 years since the Mayflower voyage to the USA. You can make Exeter and a touring trip to the South West whatever you want to make it – you’ll never be short of options!